This has been a busy month for me. Playtesting on the ATZ Final Fade Out rules has come to a stop, and like everyone else, I am now just waiting for the rules to be published. In my last Monthly Musings I said that I wanted to give my old ATZ Better Dead Than Zed campaign a proper send off. Well I have, and oh boy, what an ending! I played the final scenario of the campaign, called "Sunny's Revenge," last week and it was one of the shortest games of ATZ that I have ever played. It was all over in four turns! I'm saying no more about it (yeah, I know, tease!) but I will post the batrep very soon, probably next Wednesday. The new Final Fade Out campaign will take place in an alternate universe to the BDTZ campaign. Some characters will have the same name and use the same figure as appeared in the old campaign but they will differ in many other ways. Providing that FFO is released in the next few weeks, I'd like to start my new campaign in November but we'll just have to wait and see what happens. Once I do get the rulebook there will be a lot of prep work to do. Work continues slowly on my Stoelzel's Structures Warehouse model. On the painting front I finished painting the latest zombies and survivors from Studio Miniatures, the new zombie nurses from Grekwood Miniatures and the Victory Force armed office workers that Ernie Huff sent me a couple of months ago. I am currently painting my third batch of 25 zombies from the first Victory Force Zombie Horde. Coming up with colour schemes is the hardest part of painting civilians and zombies. Clothes catalogues and Google image searches are a big help. Just recently I made my final choice of figures for the Studio Miniatures/Indiegogo plastic zombies deal (I pledged $100) and for the Reaper/Kickstarter deal (I initially pledged $300 but ended up spending $378!). God alone knows when I'll find the time to paint that lot! I have recently read a couple of excellent novels by Rhiannon Frater, who wrote the As The World Dies trilogy, which I rated very highly. The Last Bastion of the Living is another zombie apocalypse novel but this time set about a century in the future. This stand-alone novel is part horror, part sci-fi and part love story. I liked it a lot and I may do a full review soon. The second of her novels that I read was Pretty When She Dies, the first part of a vampire trilogy that was just superb. I can't wait for parts two (out later this year) and part three (out next year) but I'm going to have to. I am currently working my way through the Rizzoli and Isles series of crime novels by Tess Gerritsen. There are ten in the series and I'm up to volume 4. The first TV series featuring the homicide detective Jane Rizzoli and Medical Examiner Maura Isles is released on DVD towards the end of this month. I will be buying it. The stories are in a similar vein to Bones, of which I am a big fan. I've had another good month at the cinema, with four films seen. In order of viewing they were Brave, a very funny Pixar animated comedy. Billy Connolly was in it and for me, that's usually good enough reason for me wanting to watch it. The man is a comedy genius. Zombies vs Cockneys was exactly what it says it is. There are a lot of very funny scenes in this comedy/horror that had me laughing out loud. I'll certainly be buying the DVD version when it is released. Sticking with the Cockney theme, I then saw The Sweeney and I was pleased to see that it was as good as the TV series, which I adored. My film of the year was Dredd 3D, which more than made up for the turkey that was Judge Dredd from 1996. I have been collecting the 2000AD comic since issue 1 (it is now up to issue 1802!) and Judge Dredd is one of my favourite strips and character. This film more than lived up to my expectations, which I must admit, were very high. Judge Dredd and PSI Judge Anderson were just superb, played respectively by Karl Urban and Olivia Thirlby. It was action-packed, brutal, violent and everything that a Dredd movie should be. I do hope this is the start of a major movie franchise. Tomorrow, I'm planning on going to see Resident Evil: Retribution. All praise St. Milla! That's all for this month. Do look out for my final ATZ-BDTZ batrep in my next post. It may just surprise you! Regular readers of my blog should know by now that I am a huge fan of GURPS. In fact, it is fair to say that GURPS is my favourite role-playing game of all time. I love it because it allows you to play in any setting and any genre - fantasy, sci-fi, historical, pulp fiction... anything! The rules can be as complex or as simple as you want and as cinematic or as realistic as you want. In August 2004, GURPS underwent a radical change when the 4th edition rules replaced the old and long-lived 3rd edition rules. To be honest, it needed an overhaul and I was glad to see it so comprehensively updated. For me, every change was a change for the better. The one major downside to this change was having to wait for the major supplements to be updated and published. Inevitably this could not happen over night. Slowly but surely the most important supplements were updated and over the past eight years I have bought them as soon as they went on sale. 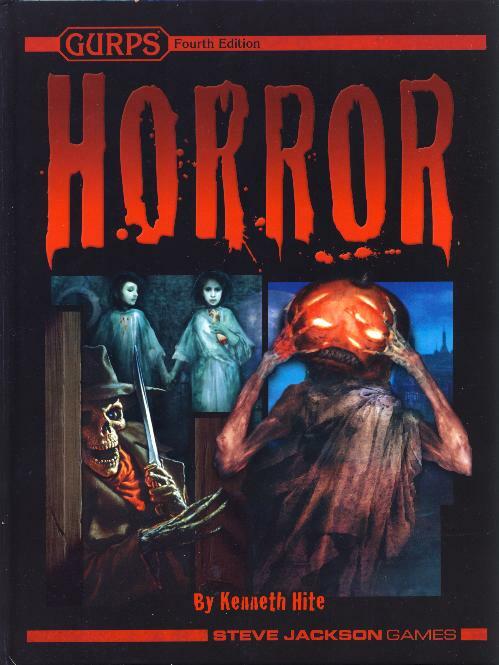 One supplement that I particularly wanted to see revised to 4th edition was GURPS Horror. Finally, in August of this year, my wait was over and GURPS Horror was published. So was it worth the wait? Read on and I'll give my verdict at the end. The major GURPS Supplements and the two rulebooks are hard-backed books with a page count of 256 and are full colour throughout, although illustrations are always on the low side. GURPS Horror differs in that it has a much lower page count (only 176 pages) and only the front and back covers are full colour. This is not a criticism. GURPS Low Tech only ran to 160 pages and somehow, black and white artwork works well for a horror setting. The book is split into six sections and I'll briefly describe each section below. Section 1 The Rag and Bone Shop covers character and party design, traits (which include the use of existing advantages and disadvantages in a horror campaign as well as new advantages and disadvantages), character templates (to help create your player character or to use to design NPCs) and the Monster Hunter's Toolbox, which lists new equipment and weapons (many of these are familiar household items). Section 2 Things That Go Bump in the Night covers the rules and stats for a plethora of monsters that you'd expect to find in a horror setting. All of the creatures you'd expect to find are here - vampires, ghouls, werebeasts, ghosts, demons, zombies, serial killers, psycopaths, aliens, Cthulhu mythos monsters and many more. I was particularly interested to see an entry for Evil Clowns. They aren't human, which goes a long way to explain Sunny the leader of my Killer Klowns gang! He has come straight from the bowels of Hell! Section 3 Dark Theatres concentrates on running a campaign and is split into six parts - Campaign Length, Narrative Structures, Antagonists, Design Parameters, Uncanny Powers and Horrifying Genres. This section is less rules orientated than the previous two and is mainly a collection of essays on how best to run your campaign. Even if you don't play GURPS you could learn a lot from reading this part of the book. Section 4 Ominous Feeling, Gathering Shadows is more concerned with scenario design than campaign design but obviously, some rules apply to both. Style and theme are well covered. It ends with a very detailed look at Fright Checks or what Call of the Cthulhu players know as Sanity Loss. In most games of GURPS, Fright Checks will be rarely used but they are so much a part and parcel of a Horror game that they needed special attention. Section 5 Tales to Terrify gives the bare bones of two campaign settings. First is a swash-buckling adventure yarn in the style of the Pirates of the Caribbean movies called Seas of Dread. The second, Blood in the Craters, is a Victorian sci-fi campaign set after the Martian invasion of Earth. The war ended in victory for humanity... or did it? Section 6 Blasphemous Lore covers lists of books, films, TV series, comics and games relevant to the horror genre. This runs for 11 pages and really only scratches the surface. I always like to read these lists in the GURPS books but I'm usually lucky if I can manage to have read or watched 10% of the subjects listed. With these lists, however, I had a greater than 60% pass rate, which isn't surprising given my love of horror. I must admit that I was very impressed with this supplement. It more than lived up to my expectations. As with all GURPS supplements, even if you don't play GURPS, you can still learn a lot from them. Any one who does play GURPS will want to add this to their collection. Horror is a gaming genre that can be applied to any setting; for example, the film Alien is sci-fi horror. It still remains a dream of mine to run a zombie apocalypse role-playing campaign using the GURPS rules. This would be taking ATZ up a level from a simplified skirmish wargame to a fully detailed role-playing game. Sadly, as long as I remain a solo-gamer it looks like being an unfulfilled fantasy. Ah well! Be aware that this is not a stand alone supplement. You do need the GURPS rulebooks (Characters and Campaigns) to run a horror scenario/campaign. If you want to buy the hardback version of GURPS Horror it costs $29.95 from Steve Jackson Games' e23 webstore. A PDF version is also available for the lesser price of $19.95. I'd like to point out that I always buy my GURPS books direct from SJG just to show my support for their products. Kenneth Hite who wrote this supplement won the 2012 ENnie Silver Award for Best Writing and the book also won the 2012 ENnie Silver Award for Best Supplement. I have no hesitation in awarding this supplement a 9 out of 10 rating. I just wish it had been longer but what is there is excellent! 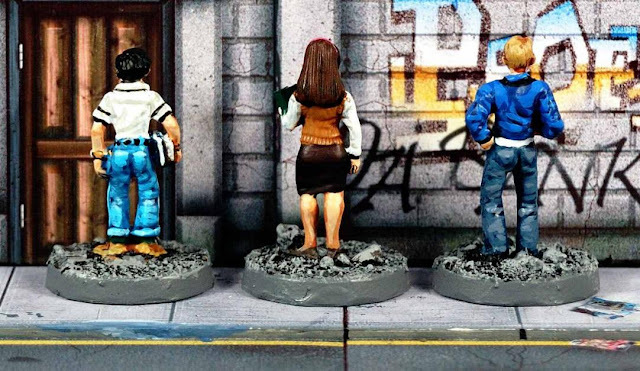 I have yet more unseen Foundry goodness for you as I continue to plough my way through their range of 28mm scale Street Violence figures. This time I'm reviewing set SV014 Mercenary Fire Team. This is a team of French mercenaries, but don't let that put you off. I'm sure these aren't "cheese-eating surrender monkeys" to quote Top Gear's Jeremy Clarkson! I have copied the colour scheme from the Foundry website, which is clearly very Gallic-influenced, and I must admit, it would not have been my first choice of a colour scheme. I'd have gone for more earthy-looking tones but seeing as they are meant to be French mercenaries, (well according to the names and colour scheme given to them by Foundry) this colour scheme is spot on. We start off at the far left with Emil Dussolier, who is armed with a 9mm Heckler and Koch MP5A3 Sub-Machine Gun. Note that this figure is left-handed, which is unusual in miniature figures. Also, note the hand grenade on the right side of his belt. To his left is Javier Japrisot and he is armed with a 5.56mm Steyr AUG Assault Carbine. The carbine has a much shorter barrel than the rifle. Javier is also equipped with a hand grenade. He is the person I have nominated as team leader. To be honest, you could choose any one of this team as the leader. In the centre of the group is "Mr. Muscles" aka Jean-Pierre Monthieux. He has removed his T-shirt in order to show off his rippling muscles (poser!) and he is the heavy weapons trooper of the team. He wields a 5.56mm M249 Squad Automatic Weapon (SAW) with a long belt of ammo wrapped around his torso. He also carries a 9mm Heckler and Koch MP5KA5 Machine Pistol as a back-up weapon. Anne-Marie Dreyfus totes some serious firepower as well. She holds a 9mm Heckler and Koch MP5KA5 Machine Pistol in her left hand and she has a M72A4 Light Anti-tank Weapon slung over her right shoulder. The M72A4 is a one-shot disposable rocket launcher that fires a HEAT (High-Explosive Anti-Tank) warhead. Finally, is Pilar Laurant, who is also armed with a 9mm Heckler and Koch MP5KA5 Machine Pistol. Slung over her back is a MK19 MOD3 Grenade Launcher, which holds 32 rounds in a drum. Note how she holds the Machine Pistol in both hands in order to reduce recoil. As with most Foundry Street Violence sets, this team is very well armed with a wide variety of weapons. The figures vary in height, which I approve of. The two females are 28mm tall, whilst Emil and Javier are 30mm tall and the huge Jean-Pierre is 35mm tall. Mercenaries are very common amongst figure companies, but French Mercenaries are exceedingly rare. Okay, with a different paint job you could make these any nationality you want. I was happy to go along with the French connection, as it is quirky and different. Also, being mercenaries, they could turn up anywhere in the world... even in Mayhem City! This set of five figures retails at £10.00 on the Foundry webstore. Today, I'm going to review three sets of 28mm scale figures from the RAFM USX Modern Day Heroes range - set RAF02809 Decius the Terrorist Cell leader, RAF02810 Terrorist Cell (4 figures) and RAF02811 Karl H. Unger the Terrorist Cell Enforcer. At the far left of my two photos is Karl H. Unger, the terrorist cell enforcer. He is the only terrorist not to be wearing a balaclava, a jacket and body armour. So, he stands out from the rest of the team as either a hardass or as someone with a deathwish. Or, perhaps both! He is armed with the ubiquitous terrorist weapon of choice - the 7.62mm AK47 Assault Rifle. He also has a BA Pistol holstered on his left hip, a couple of grenades hooked onto his shoulder straps and he wields a vicious-looking Bowie Knife in his left hand. He is not a man to be messed with! Next in line is the cell leader known as Decius. Is that his real name or an alias? Who knows? He holds a 12 gauge Franchi SPAS12 Automatic Shotgun aloft and has a BA Pistol in a holster on his left hip. The mouth of his balaclava has been left open, so he can shout out orders without sounding muffled. I decided to paint this group in an urban camouflage pattern made up of a mid grey background with black and white streaks on top. It has come out very well in my opinion. The next four figures are unnamed mooks from the Terrorist Cell set. The one standing next to Decius is a one-piece casting armed with a 7.62mm AK47 Assault Rifle and a BA Pistol. I have added one of the spare rocket clusters for the RPG7 rocket launcher to him. This set comes with two lots of spare rocket clusters and it's up to you who gets them. The next two figures in line are identical sculpts but come with their arms and rifle as a separate piece. By gluing the arms on in different positions they look slightly different. One appears to be firing his AK47 and the other is holding his rifle in a more relaxed pose. The final figure in the group is the heavy weapon member of the group. His arms and RPG7 Rocket Launcher were a separate piece, as were the spare rockets hanging from his belt. He also has a BA Pistol in a holster as a back-up weapon. As a terrorist cell, these fall under the category of Gangers if used in ATZ, although you could get away with using them as a militia Survivor group. The inclusion of the RPG7 gives them some real punch in a firefight but if you were going to use them in ATZ you'd need to come up with your own stats for it. As ever with RAFM figures I must give a word of warning about their size. These are closer to 35mm in height than 28mm, which makes a mockery of RAFM's assertion that they are 28mm scale figures. I'll still use them in my games but for some of you they may be too large. Karl and Decius cost $5.95 each, whilst the set of four terrorists costs $12.95. Pricey, I know, but they are a nicely sculpted group of figures and they fill a niche that few other companies cover. 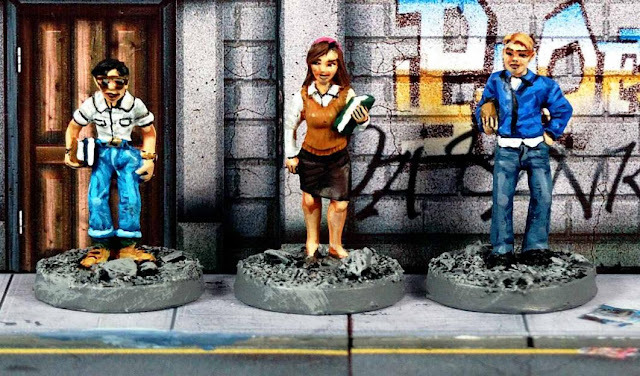 The five figures that I'm reviewing today come from Foundry Miniatures' set SV017 - The Hardwire Troupe, which are part of the Street Violence range. This team of hardasses are heavily armed, well armoured and ready to take on any challenge. My first impression when I saw them was "Black Ops." Interestingly enough, there is a supplement for GURPS 3rd Edition called Black Ops, in which players are part of a five man team made up of specialist characters from the following five departments - Combat, Intelligence, Science, Security and Technology. A typical Black Op agent is built on 700 points, meaning they are very high-powered characters. Below, I describe my own GURPS Black Ops team. I have given them all names, some of which are based on the Christian names given to them by the Foundry folk, whilst the rest are my own inventions. At the far left is Penelope Meilinger and she is from the Technology Department. Note that all agents wear flak vests, black coveralls, black leather dusters (long coats) and mirrorshade sunglasses. Penelope carries a 5.56mm Steyr AUG Assault rifle with a modified scopesight and folding bipod. She is also armed with a pistol in a holster on her left hip and who knows what is in her reinforced briefcase? Next up is Miranda Ramirez, who has dyed her normally black hair bright orange! Don't be fooled by her quirky look - she is a member of the Intelligence Department. She is armed with a pair of 9mm Heckler and Koch MP5A2 Sub-Machine Guns. Note that with both guns she has taped two ammo clips back to back to facilitate a faster reload time. She also has a pair of pistols in holsters on both hips. She is unique in wearing thigh-length boots. These aid her in stealthy movement. In the centre of the group is Curtis Quint, the Combat specialist of the team. He carries a 5.56mm M249 Squad Automatic Weapon (SAW). On his belt are two holstered pistols, a Flash-Bang grenade and a High Explosive Grenade. Curtis is slightly taller than the rest of the team and I painted him as an African/American. All Black Ops agents are black belt martial artists, but Curtis really excels in melee combat. Fourth in line is Fabian Tancredi, the Science Department agent. He has very long, natural blond hair, which makes him stand out as much as Miranda. He is holding a 9mm Heckler and Koch MP5A3 Sub-Machine Gun in his hands. He has a Pistol in a holster on his left thigh, and possibly one on his right thigh. If so, it is hidden by his long coat. He wears a back pack, which like Penelope's briefcase, could hold just about anything. The fifth and final member of the team is Sean DeSanto, the Security Department agent. He is armed with the very rare 5.56mm ATK-Heckler and Koch M29 Individual Combat Weapon - a combination Assault Rifle and Grenade Launcher. He also has at least one BA Pistol in a holster and a Flash-Bang grenade. Security agents are meant to be a jack-of-all-trades and are expected to know a little bit about everything. This probably explains why he is carrying such a large flight bag across his back. I have described these as part of my GURPS Black Ops team, simply because they are such a perfect fit, but they need not be. These could be any group of professional monster hunters or just a group of mercenaries, working together to survive a zombie apocalypse. If you are looking for something more cinematic in scope, like a team of vampire slayers or werewolf hunters, then look no further. Any one of these figures would make a great player character in the likes of ATZ. However, put them together and you have a formidable team of fighters, capable of taking on the toughest of foes, be they human or supernatural. Foundry Miniatures sell this set of five figures for £10.00 on their webstore. Incredibly, I wrote this review without once mentioning The Matrix. D'oh! This book review is something of a departure for me. 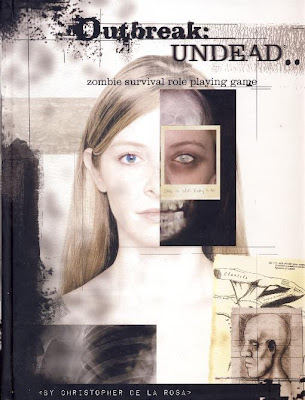 Outbreak: Undead is not a novel but a role-playing game rulebook. The idea of taking a zombie skirmish game like ATZ to the next level, i.e. a full on role-playing game is something that intrigues me. When I first saw Outbreak: Undead I thought that this ought to be the ultimate zombie apocalypse RPG. The book itself looks impressive. It is hard-backed and runs to a whopping big 452 pages. The blurb on the back cover states, "Outbreak Undead is a Zombie Survival Simulation RPG that is not only fun but an essential step in surviving the Undead. This book provides the most dramatic, effective and above all, realistic means in which to (safely) simulate the events of a zombie uprising and try your chances at survival." However, I was immediately on my guard when I opened the book. The main body of text is presented as hand-written notes on lined note-paper. Yes, it is different and it gives the book a unique feel but I was not impressed by this format. "A simple and unique percentile based game system. Use of everyday items as weapons against the undead. Endless scenario types that can form missions from any and all existing zombie lore. Easy to use charts to customise outbreak scenarios for players of all levels of experience. Dynamic and realistic rules including factors such as "Panic," "Pain" and "Empathy." Character templates for all survivor archetypes: firemen, military personnel, civilians and more! Even the ability to play yourself as a character!" The core mechanics of the game is a percentile system. Rolling lower than or equal to the target number is a success. Each 10 you roll higher or lower equates to a degree of success or failure, so if you needed a 53 or less to succeed and you scored 13 or less, you'd have four degrees of success. However, bonuses and handicaps are listed as levels, with each level representing 5%. So, a level 2 handicap would give you a -10% penalty. Hmm, what did it say about "a simple and unique" system? Characters are built on four primary attributes - Strength, Perception, Empathy and Will to give you the SPEW system. Well, that put me right off for a start! Again, these are percentile based with average scores being in the 16-30 range. Yes, your attributes do start out very low. You add character type, skills, traits and special abilities to round out your character. An example of character creation would have been a great help but none is provided. Indeed, this is a flaw throughout the book - a lack of examples of game play. The chapter on basic gameplay follows. Then come the rules for zombies, which features various types of zombie, some of which computer gamers will recognise. In a book of this size, I was expecting to see a lot more zombie types. Rules for weapons, equipment, vehicles and combat follow. No real complaints here apart from the comabat rules which need more examples of gameplay than are presented. With a book this size I would have expected the proofreading to be impeccable. It isn't! The book is littered with spelling mistakes and typos. The most serious error occurs in the chapter on scenarios and game missions. The page numbers go 386, 387, 388, 391, 392, 389, 390, 395. 396, 393, 394, 397, 398, 399 and then carries on normally. That is unforgivable! There are lots of charts to refer to when (if) you do play the game but they are spread thoughout the book. Why couldn't they have had a section at the back of the book with all of the relevant charts in one place? Gameplay will be seriously interrupted as you search through the book to find the chart you want. Remember, this book is 452 pages long! I really wanted to like this book. I was hoping for the ultimate zombie apocalypse RPG but this most definitely is not it. I came away from Outbreak: Undead desperately disappointed. The basic game mechanic is clunky and given the low starting attributes of your character(s) you'll find yourself failing more rolls than succeeding. The artwork is very poor, but that is a minor quibble compared to the book's many other faults. The three things that I least liked about these rules were the lack of examples of character creation and gameplay (there are some, but not nearly enough), the absence of all the charts collected in one easy to find place, and the appalling proofreading. If you are looking for an excellent zombie apocalypse RPG I would recommend All Flesh Must Be Eaten. My second choice would be GURPS, which covers just about any genre you can think of. Also, GURPS Horror for the 4th edition rules has finally been released and I'll be reviewing it as soon as I finish reading it. Sadly, I can only give Outbreak: Undead a 2 out of 10 rating. Even sadder, I paid £33.99 for it. Money wasted! 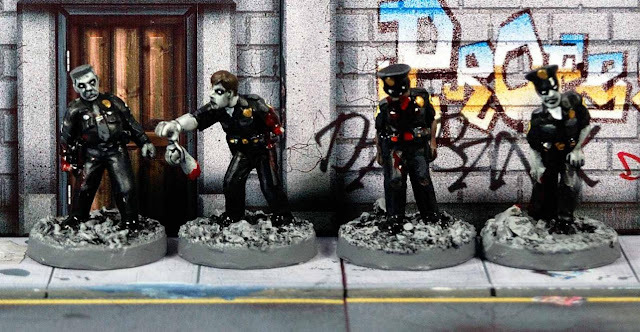 Following on from my review of the four Studio Miniatures' zombie cops, I'm now going to review the "Grunts and Screams" set, which contains four 28mm scale US Army soldier zombies. This review ties in with my last one, as I bought and painted both sets at the same time. When a zombie apocalypse kicks off, it is inevitable that many of the first vistims to be infected will come from the emergency services as they struggle to contain the problem. Soldiers, whether they be from the regular army, special forces or National Guard, will be in the front line and will suffer many casualties. As such, this is a set that I welcome very much. I have painted these guys in the same camo pattern that I used on my Black Scorpion US Army troops (I haven't got round to reviewing them... yet). It is my interpretation of the current digital camouflage scheme used today in the US Army. It's not the easiest camo pattern to paint in 28mm scale but I'm happy with it and to be honest, that's all that counts. At the far left of the two photos above is a soldier whose left arm has had most of the flesh stripped from it. You can see bone showing through from his shoulder to his wrist. Oddly, his left hand hasn't been touched. He is holding on to his pistol holster in his right hand. 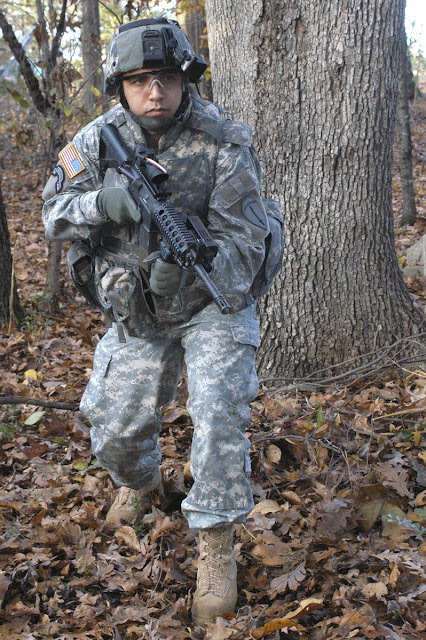 He is one of two soldiers wearing a helmet. The second helmet-wearing grunt is lurching forward with his left arm stretched out. Note all the ammo pouches that he has on his chest. Other than the holstered pistol on the previous figure, these are all unarmed. But being zombies, they have no need for weapons. The third zombie in line is clutching something to his chest but I wasn't sure what it was. Just as I'm not sure what the cylinder on his back is for. Are the two related? Is it a gasmask and oxygen cylinder? There is a tube leading from the bottom of the cylinder to his front. I decided to smear his hands in lots of blood, which has covered his front to help obscure whatever it is in his hands. Heck, it could be an internal organ, like a heart from some victim! The figure last in line was one of the walking wounded before he became infected. His right wrist has been bandaged and he he has a bandage wrapped around his chest and back. His jacket is half on and half off, which is a nice touch, and helps to show off his prior injuries. He wears dark sunglasses, which also makes him stand out from the crowd. Here we have four very well sculpted zombie soldiers. If you feel you don't have a use for them, you could very easily paint them up as SWAT troopers. This would tie them in with the cops I reviewed last time even more. Inevitably, I like them a lot and I can highly recommend them. Hey, they're by Studio Minis - what's not to like? This set retails at £12.99 from their webstore. EDIT: Here's the image I found on Google that I used to base my camo scheme on. Confession time. I have had this batch of figures painted and ready to review for a couple of months but it is only now that I have gotten round to reviewing them. They are the Studio Miniatures "To Kill and Serve" set of four 28mm scale scale zombie cops. I feel guilty about waiting so long to post this review as I love Studio Minis. Incidentally, I finished painting these just after I'd finished playing my Assault on Precinct 13 scenario, which is why they didn't make an appearance there. The set consists of a sergeant and three patrolmen. At the far left of my two photos is the sergeant and you can see his sergeant's arm stripes better on the reverse view of him. He is slightly overweight, which is a nice touch as he probably spends most of his time behind a desk than out on the streets. Note his senior status is reinforced by the fact that he is the only one out of this group to wear a long-sleeved shirt and a tie. I painted his hair and moustache grey to further show that he is a veteran member of the force. I have painted him with a blood covered right hand. Whether it is his own blood or that of a victim is uncertain. Next up is undoubtedly the "star" figure of this set. He has a pair of handcuffs, one half of which is tied to his right wrist, whilst the other half is still attached to the hand and lower arm of whoever he had arrested. There is a slight possibility that the arm dangling from the handcuffs may be his own, seeing as his left arm has been severed at the elbow. I find that possibility stretches credibility a bit too far. He is definitely one zombie you won't forget in a hurry. Third in line is an African/Anerican patrolman shuffling forward with his head bowed. This figure just screams "shambler". It is a simple and rather boring-looking pose, but actually, is very effective. Although he bears no obvious wounds he is still, unmistakably, a zombie. I smeared his mouth, chin and neck with blood to show he had been feeding recently. Some of the blood has dripped down and covered his belt buckle. Finally, is a zombie staggering along with a serious leg wound, which is particularly noticable when you look at him from behind. His pose perfectly captures the way he is limping unsteadily as if his right leg can barely support his weight. He also has a very long gash in his lower left arm, which is probably a knife wound. This set is up to Studio Miniatures' usual high standards and they are a must for any zombie horde. Even if your zombie apocalypse isn't centred in America, you could still use these as zombie cops in most countries of the world. I imagine these guys will now be hanging out in the Mayhem City Precinct 13 Police Station. This set of four figures retails at £12.99 from Studio's webstore. Next time, I'll be reviewing yet more Studio zombie goodness. See you on Sunday. As an accompaniment to my review of the Reaper Geeks (see here) here are another three students from college, high school or university - Reaper set 50090 Townsfolk: Jock, Chick, Nerd, which are part of the 28mm scale Chronoscope range. At the far left of these two photos is the Nerd, a stereotypical character with glasses and below average looks. He has a couple of text books tucked in his right hand. He has tried to dress casually but his lack of fashion sense shows in the way his jeans have been folded up far too much at the bottom of his legs and his socks are clearly visible. The chick could be friends with the Nerd, as she is also holding a text book or perhaps its her exercise book. She is very pretty with neatly groomed hair and she is smartly dressed. There is nothing slutty about her. She clearly has brains and beauty - a winning combo. I like how I have captured her smile. Finally, is the Jock. No, he's not a Scotsman! Sports and outdoors activities are his forte. We can see this by the fact that he is holding a football, i.e. from the sport of American football, not soccer. He is also dressed casually, but this time he has got the look just right. He is blond-haired and good-looking, but what is his attitude like? Arrogant, big-headed and a bully? Or is he sociable and friendly? These three are a perfect match up to the three Reaper Geeks that I mentioned above. Also, if you are looking for more civilians in your game, these are very well sculpted and would be worthy additions. As I keep saying, you can never have too many civilians. After all, the undead need lots of victims to feed upon! This set cost me £6.35 when I ordered it from Miniature Heroes, a UK-based company who imports Reaper miniatures from the USA. If you live in the UK, they are worth patronising as they save you on postage and the hassle of having to deal with our Customs and Excise robbers.